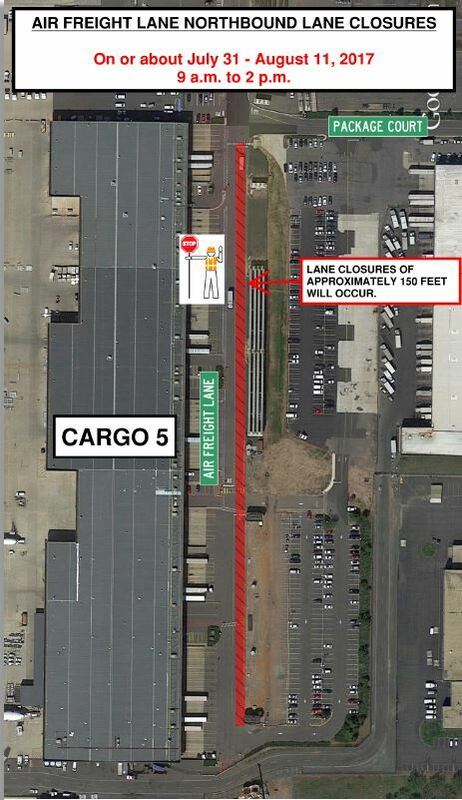 Lane Closures on Northbound Air Freight Lane at Dulles International Airport July 31 - Aug. 11, 9 a.m. to 2 p.m.
July 31 - Aug. 11, 9 a.m. to 2 p.m.
On or about Monday, July 31 through Friday, August 11, from 9 a.m. to 2 p.m., lane closures of approximately 150 feet will occur on northbound Air Freight Lane near Cargo Building 5 at Dulles International Airport while track construction continues on the Silver Line's aerial guideway. Flaggers will be present for safety, and access to all tenant facilities and cargo bays will be maintained. Drivers are asked to use caution, remain attentive to all signage, barricades and speed limits and obey all flagger instructions. Large, slow-moving vehicles and equipment may be exiting and entering the work area at various times.